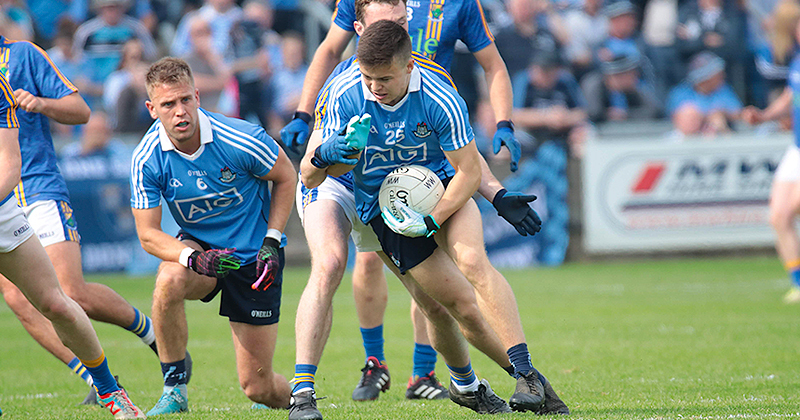 Dublin kick off their Lidl NFL campaign against Donegal today in Croke Park and earlier this week at the official launch both ourselves and FM 104’s Peter Brannigan spoke to Dublin’s Sinead Goldrick. Peter spoke to Sinead at the same event two years ago and at the time she had suffered defeat in the previous years inter-county and club All Ireland Finals and Goldie was contemplating taking a break from the game back then. Although Sinead won the All Ireland championship with Dublin in 2018 she once again suffered defeat in the club championship final, so this time round how has the reaction been to that defeat. “Obviously really disappointed, we felt as a team that we didn’t perform on the day. “I suppose I am looking at it this year as a blank canvas in terms of doing well, in both county and in club. So I am just trying to get the body right and focus – there’s 14 new players in the Dublin set up so you don’t have too much time to dwell on it. So the the feeling was different this time round for Sinead but did she have any thoughts of maybe taking a break this year? Sinead Goldrick joined the panel in 2011 and during her time in the squad Dublin suffered some disappointments, but they managed to put that behind them and win back to back All Ireland’s did the players realise how massive an achievement that was? “Yeah that was huge, and I suppose the heartbreak of all those years keeps you ticking and if you taste success you really want that for the team. “For us to try and do our best you know again, we are back to league we are playing Donegal, its winter football and we are trying to get as fit as possible. During the inter-county off season there was talk about Mick Bohan going to Roscommon and various other things, but that all stopped when it was announced that Mick was staying in charge for another two years. Sinead didn’t take much notice of the rumours and expressed about how much she enjoyed working with him. “Mick is brilliant and I am not too sure, those rumours were going around but he is a Dublin man through and through, our whole management team are absolutely brilliant, every single one of them has a role. Sinead Goldrick during her Dublin playing career has played under a few different managers, but what was it that Mick Bohan has brought that was different and created the edge to the team. 2018 was a hugely successful year for Dublin as they won their maiden Division 1 League title, a seventh Leinster title in a row and 2nd All Ireland title in a row, they set very high standards throughout. But it’s a new year and successful teams can’t rest on the laurels and need to improve, we asked Sinead how Dublin having set such high standards last season are going to raise it even more in 2019. “I suppose it is a new year and it’s a new challenge that a lot of teams have and it’s trying to get that extra edge and it’s up to the players to step up, to increase the expectation and I also know our management will do everything to try and make sure that there are new drills and we are improving ourselves. For the teams that reach the All Ireland Final it normally means a later start back to training for the new season, did Sinead Goldrick think with Dublin only back collective training a couple of weeks that they would be at a slight disadvantage in the early rounds of the league against sides who probably have a bit more training done. “There was people training before Christmas in terms of new people coming on board and you’re an athlete so you want to be coming back as fit as you can so I know there have been girls doing their own thing even if they were not involved with Dublin. Dublin teammate Noelle Healy in an interview last week discussed how training was now very player driven, Sinead Goldrick believes that if you are on a senior county team then it has to be that way. “I think if you are on a senior county team it has to be driven by the players, the management always encourage that and we are really lucky in Dublin, there are a lot of leaders that step up at different times, there a lot of different voices that contribute and it’s probably a huge reason as to why we have done well because we are not reliant on just a few players to step up and talk.